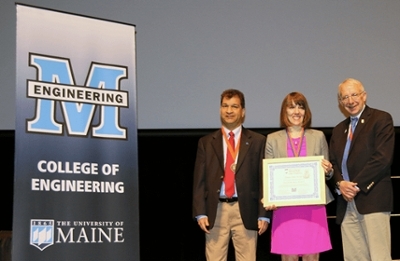 Professor Danielle Benoit was presented with the 2018 University of Maine Francis Crowe Engineering Distinguished Alumni Award during the University’s graduation ceremonies on May 12. The award, presented by Hermant P. Pendse, chair of chemical and biomedical engineering and Dana N. Humphrey, dean of the college of engineering, recognizes outstanding service to the field of engineering. As a distinguished member of the Francis Crowe Society, Professor Benoit will now be known as Distinguished Engineer Danielle S.W. Benoit, Ph.D., ‘02.